Could we actually build a robot the size of Pacific Rim's massive Jaegers? Let's face it, we're all deeply infatuated with gigantic robots, a science fiction staple that includes such memorable mechanical monsters as Voltron, Gundam, the Transformers, the Mighty Morphin Power Rangers — and even the AT-AT Walkers of Episode V. But none of these enormous mechas hold a candle to the behemoth that was recently unveiled in the promo poster for Pacific Ring. 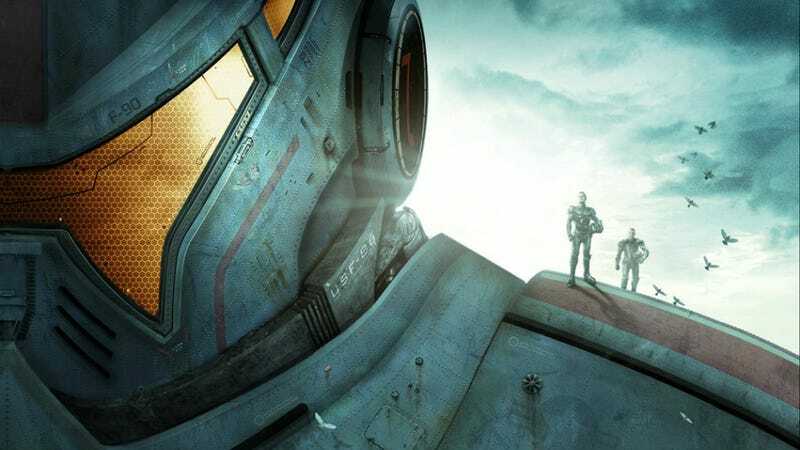 First Look at the Giant Robots in Guillermo del Toro&apos;s Pacific Rim! Once our jaws were closed and set firmly back into place, we were forced to ask the question: Could we ever build such a thing — and just as importantly, why would we ever want to? We talked to robotics expert Daniel Wilson to find out. And Wilson would be the right guy to ask. He earned a PhD in robotics from Carnegie Mellon University and is the author of How to Survive a Robot Uprising, Robopocalypse, and most recently, Amped. Wilson is no stranger to robots and, in particular, the various forms and shapes we may someday be able to give them. And like us, he questioned the science and the rationale behind Guillermo del Toro's massive Jaegers. A good place to start this investigation is by looking at we've already been able to produce. As it stands, the largest functional robot currently in use is Vulcan Engineering's MegaBot. It's an electric articulated-arm production robot that has a reach of six meters and can pick up objects as heavy as 3,675 lbs (1,670 kg). It can spin 360 degrees and handle pitch torque up to 180,000 inch-pounds. And it features an impressive grip force of up to 9,700 lbs (so be careful when you shake its hand). Now, as impressive as MegaBot appears to be, it's clearly a far cry from Pacific Rim's monstrous mecha — something that's several orders of magnitude greater in terms of both its size and complexity. Daniel Wilson told io9 that he doesn't believe a robot the size of a Jaeger could be built with the materials we currently have available — at least not on Earth. "A giant robot of that awesome magnitude would be more feasible on a smaller planet with less gravity and made from advanced materials — nanomaterials or hell, light, as in a hologram," he said. But as for our ability to build such a thing on Earth, he remained dubious. "I don't know how any actuator would be able to keep such a giant structure upright in a high wind, much less move it with enough dexterity to walk," he noted. Wilson's point is very well taken. Assuming strong, lightweight materials could be developed, the sheer enormity of its moving appendages would still cause tremendous strain on its mechanical parts. Managing all the various dynamics involved, including the robot's velocity, acceleration, momentum, heat dissipation, and internal torque, would likely be completely untenable. Even if such a thing could be built, it would likely have to move at an agonizingly impractical slow pace. Just imagine trying to slow this thing down once it got going! Indeed, as Carnegie Mellon University roboticist Mel Siegel noted in his paper, "When Physics Rules Robotics," one of the primary problems of robotics is dealing with any excess weight. Engineers are constantly pushing the envelope of what's possible in terms of size, often working to prevent the weight of the robot to cause it to collapse in on itself. This, among other reasons, is why Honda's humanoid ASIMO is so tiny at 1.2 meters in height. And then there's the energy factor to consider. After contemplating the amount of power required to energize a skyscraper sized robot, Wilson quipped that it would "require a hell of a lot of batteries." That said, he suspected that we might someday be able to wirelessly beam energy, use nuclear reactors, or even have an in-house power plant at work. Cost is another important factor. It's fair to say that assembling a fleet of these things would be cost prohibitive to say the least. For reference, SciencePortal conducted a calculation a few years ago to see how much it would cost to build a Gundam, a fictional 43-ton humanoid robot. Looking at the requirements — a list that included aluminum alloy, metal processing, a main computer, gas turbine engines, superconductive motors, and more — the Japanese science and technology researchers concluded that it would cost no less than $725,000,000 to build. And that's just for one Gundam, which would appear downright child-like standing next to one of del Torro's Jaegers. Now, perhaps the strangest thing about the Pacific Rim megabot — aside from its ludicrous size, of course — is the fact that it appears to be a humanoid mecha, equipped with arms, legs, torso and head. Clearly there must be a very sound reason for this, as human-like form would indicate function. So what, exactly, is this robot supposed to do that requires bipedal proportions? If it's combat against a similarly sized and equally proportioned enemy (which appears to be the case), then surely something more dextrous and powerful could be developed — something not so human. Wouldn't something more tank-like, with a low center of gravity and tons of guns, be more practical? Humans are, after all, fairly wimpy as far as physical fighting is concerned. We're better built for other tasks. Wilson agrees. "Roboticists typically use a humanoid form on a human scale, because it allows the robot to operate seamlessly in human environments," said Wilson, "So, I do have to wonder why it would be useful to have such a gigantic robot in a humanoid shape at all, anywhere, for any circumstance — besides the obvious cool-factor, that is." And on that point, Wilson is likely on to something. The only possible reason for producing a robot of that size on Earth would be for aesthetic purposes — an accomplishment of structural engineering simply for the sake of seeing if it could be done. But as for it being something practical or helpful, that's more unlikely. "All that said," Wilson told io9, "no amount of pontification will change how utterly badass this robot is." Inset image of ASIMO via Wikipedia/Vanillase, MegaBot via Vulcan Engineering. Gundam image via Weihomemagazine.